In the ESS department, 100 percent of faculty have Ph.D.s, and they serve, first and foremost, as professors. But, they also publish in journals including ACSE Journal of Hydrologic Engineering, Weather, Biological Conservation, Freshwater Science, African Journal of Ecology, Conservation Biology, Journal of Wildlife Diseases, Primates, Folia Primatologica, Frontiers of Plant Science, Journal of Comparative Psychology, Behavior, Biological Conservation, Current Science, and Animal Conservation. The Department also hosts federal employees from the Corps of Engineers Institute for Water Resources who provide guest lectures, tours, and research opportunities for students. 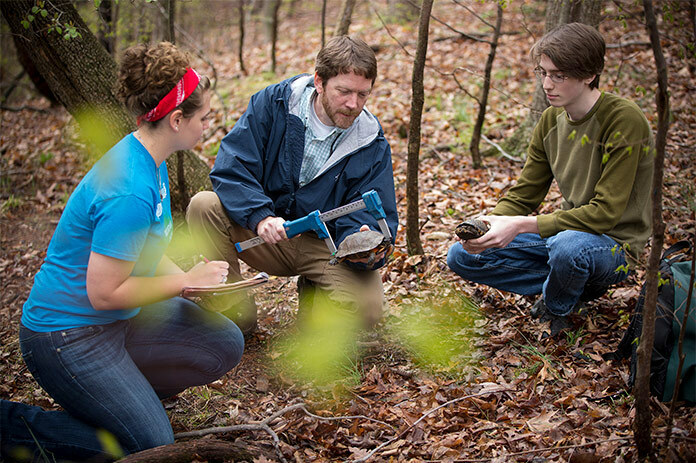 Click on the banners below and learn more about what makes an environmental science experience unique at Juniata College. Just minutes from campus, study for a day or an entire semester at Juniata’s Raystown Field Station, an environmental research complex on the shores of Raystown Lake. There, you can enjoy 24-hour access to expansive, mountainous wildlands within the Raystown Branch of the Juniata River watershed, a major lake fishery on Raystown Lake, as well as an educational program rare for an undergraduate institution. The department has a relationship with the U.S. Army Corps of Engineers which adds research and applied science experiences on more than 29,000 acres of water and forest resources. Start your own research project or join ongoing projects estimating whitetail deer populations, studying sustainable agriculture in India, examining larval fishes in Raystown Lake, or monitoring trees as part of the breeding program to restore the American Chestnut at several orchards including one on campus. Our students also restore wetland habitat on abandoned farmlands and test the impact of composting on soil quality. 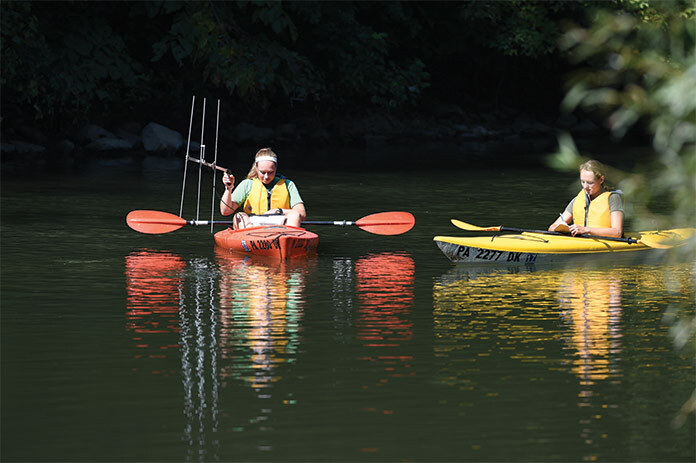 Juniata has a fully-equipped water analysis lab, groundwater monitoring wells, a 24-foot pontoon boat, a 36-foot houseboat, laser-induced breakdown spectroscopy, colorimeters, GIS and GPS devices, and much more. In fact, our spatial analytics lab has 20 high-end workstations with the latest GIS software. Certificates in Geographical Information Systems, Naturalist Guide, Wildlife, and Fisheries are available. 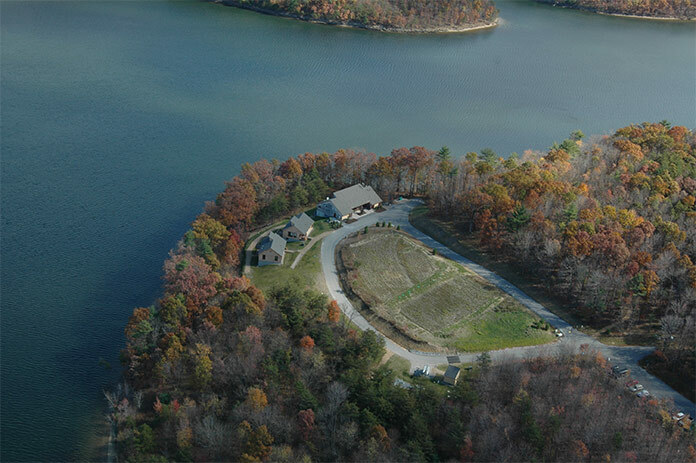 Juniata’s Raystown Field Station is an environmental research complex on the shores of Raystown Lake. 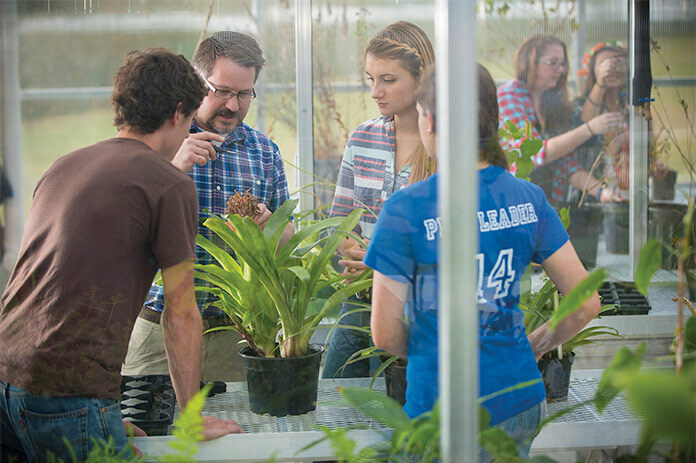 Glaeser Greenhouse provides space for research, propagation, and collections. 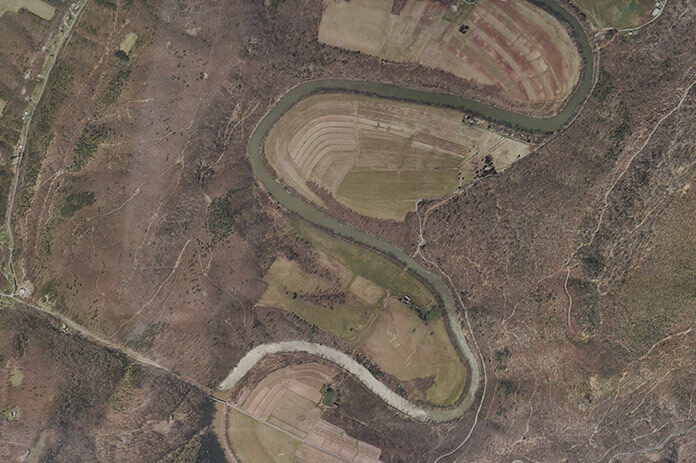 The 378 acres that encompass the Sparks Farm includes invaluable riverfront access. Environmental science students Emily Nye ’16 and Stevie Kitching ’16 track trout movement in the Little Juniata. ESS students are in the field starting with the first introductory course. 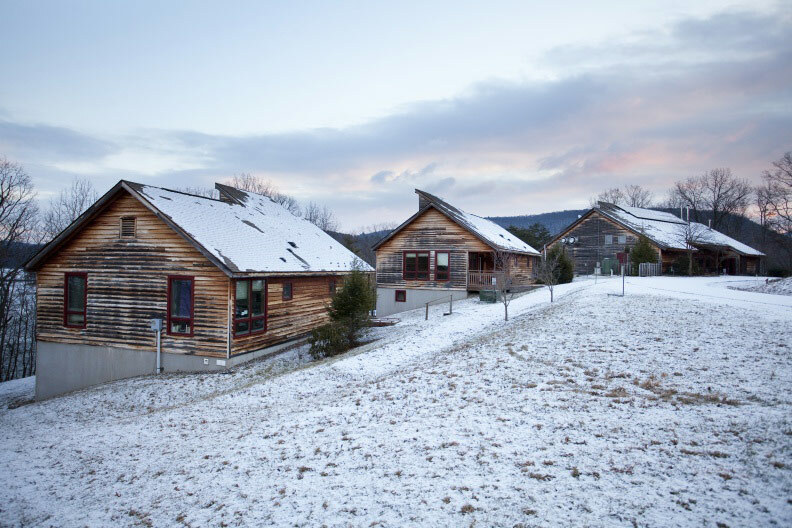 Juniata's Field Station taken over by the cold, snowy winter season. employed at the Dolphin Research Center at Walt Disney World in Orlando, Fla.
works as a field technician assistant studying whip-poor-will ecology at the University of Massachusetts-Amherst. conducts sea turtle research on Little St. Simon’s Island for the Georgia Department of Natural Resources. works as a field technician studying small animals with the National Ecological Observatory Network in Wisconsin. Study Abroad: ESS students have explored Ecuador, India, New Zealand, and Rwanda in recent years. Remote Field Course: Join Juniata’s Remote Field Course and learn geology, ecology, psychology, anthropology, physics, and other disciplines in various locations in the western United States. The Environmental Fellowship: Network at a professional conference and create a project in service learning with a leading environmental agency. After your first year, you can apply to receive $6,000 and a highly selective fellowship.